Minox offers a starlight technology generation 1+ monocular and a digital night vision monocular that has 2.5x magnification and a built-in IR illuminator. 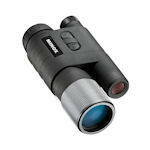 Minox offers two night vision monoculars. The NV Mini is a Gen 1+ night vision monocular the size of a tube of lipstick. The NVD uses digital IR technology.